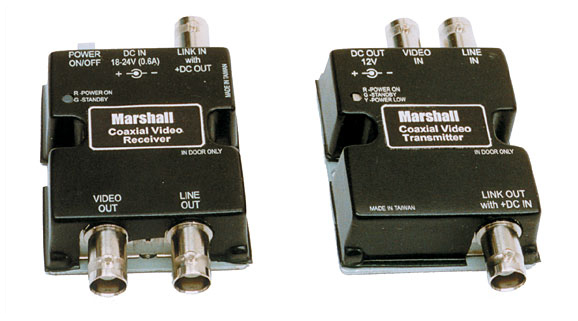 The Marshall coaxial video receiver is a product that can send Audio, NTSC/PAL Video and Power over a single RG59 coax cable. It works with cameras and monitors ideal for monitoring areas where no power is available to operate a camera. The V-VL2122-01 is a product that can send Audio, NTSC/PAL Video and Power over a single RG59 coax cable. It works with both color and B/W cameras and monitors. It is ideal for monitoring areas where no power is available to operate a camera. On the monitor side, the viewer part of the unit uses 18 to 24VDC (depending on length of coax). This voltage will go across the coax cable and the unit will output 12VDC on the sender side. Both the sender unit and the monitor unit has BNC connectors for the audio and video inputs and outputs. The units measure 2 inches wide and 2.5 inches long each with screw holes for any permanent mounting application. Unit comes complete with power supply, sender and receiver units and users manual.